** Girls, are you prepared for the most amazing experience in “nail art” designing? Fasten your seat belts as we created a nail salon game which will definitely earn your undivided attention! Set your creativity free and be the best nail polish artist among your friends. You can make “nail designs” so unique and beautiful that they will leave no one indifferent. ** You can choose from a variety of tools provided by our new nail salon games for girls and create little pieces of art on your fingernails. Use every means provided by our nail art game in order to create nail polish designs of your dreams! 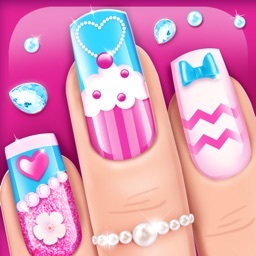 Try out our new free app Nail Art Designs Games now and let the hidden artist in you blossom! 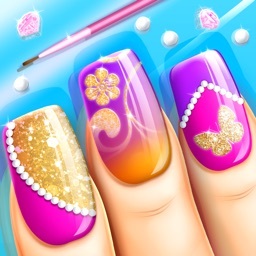 * Release your inner artist and create nail designs from your dreams with one of the best nail art games ever! * Choose the skin color you prefer! * Choose from various nail shapes! * Many different types of nail art pens. * The largest nail polish color palette. * All kinds of cute stickers. * Choose a background for your photo. * Choose a hand pose and take a photo. * Save all your cute nail art ideas in your phone gallery and share them on Facebook, Instagram and Twitter. * Interface is easy to use. * Infinite and fun gameplay with unlimited combinations! ** There is no need to search the Internet for a perfect nail art. With our nail polish game you can release your inner creativity and make wonderful and original nails on your own. You have the opportunity to be the best nail art designer in the world! The creative fun begins with our Nail Art Designs Games app! ** You can have a prestigious nail spa art salon on your phone which you can access at any time! Without appointments, without waiting – you are one click away from outstanding and elegant nail designs! Treat yourself to a fashion nail makeover free! Just imagine you're in a princess “nail salon” and have fun creating beautiful nail manicure designs. ** Did you ever find yourself searching for the perfect nail design but there was always something missing? With our nail salon game you can create “nail polish” designs which suite every one of your needs. Choose the most wonderful nail colors, patterns, stickers, glitter nails and combine them into a magical nail varnish design which will amaze everybody! 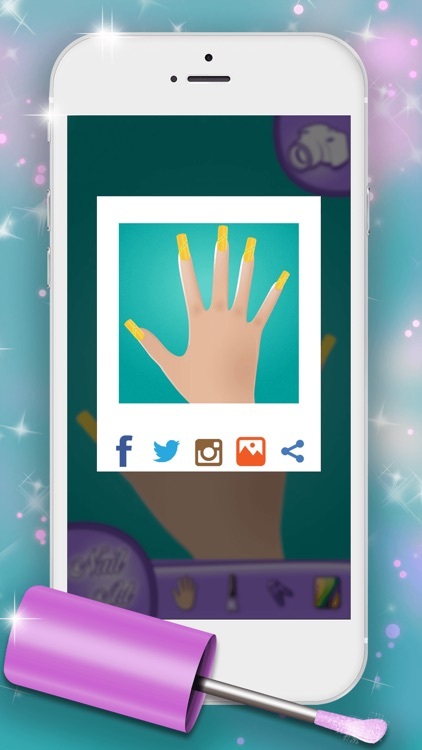 ** If you are a fashionable and trendy girl, our free nails salon game is perfect for you! Every fancy girl knows that the key to a good style lies in details and that is the reason we made sure that our nail art game provides you with every necessary tool that will help you in your everlasting quest for outstanding nail designs. Be the first among your friends with the most impressive nail design ideas ever! ** A lady cannot be a lady without stunning nail manicure. You will agree that the most important things for a girl are a stylish haircut and fantastic luxurious “nail design”. And if you like hair style games and manicure salon games for girls, you will love our Nail Art Designs Games. 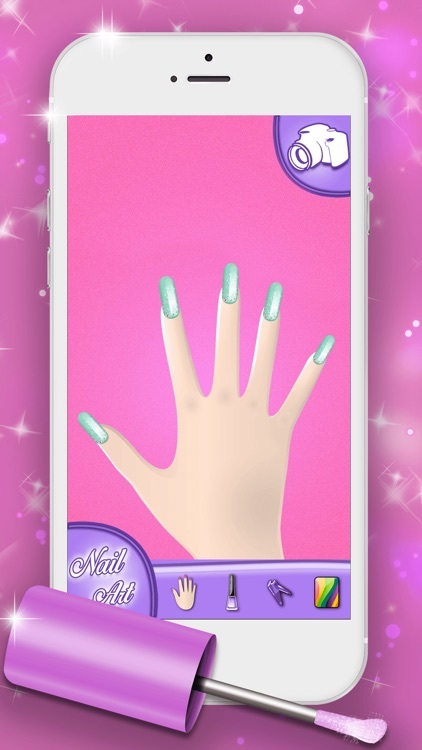 With this amazing nail salon game you can realize all your ideas in an easy and creative way. You can enjoy making artistic and charming nail designs which have never been seen before! ** Create nail art designs according to your remarkable personality and style. Take some time to relax and engage your imagination in creating lots of fashionable gel nails. Improve your million-dollar look with modern and sophisticated fashion nails. Use the unlimited possibilities offered by this new free app and remember – a lady always has a gorgeous smile and spectacular fingernail art! * The game is free but contains certain InApp packages that can be purchased for real money.